For the ship Pacific Princess, see MS Pacific. For other uses, see Love Boat (disambiguation). "Isaac Washington" redirects here. For the video game character, see The House of the Dead: Overkill § Characters. The Love Boat is an American comedy/drama television series set on luxury passenger cruise ship S.S. Pacific Princess, which aired on the ABC television network from May 5, 1977 until May 24, 1986; plus, four three-hour long specials aired in 1986, 1987, and 1990. The series revolves around the ship's captain Merrill Stubing (played by Gavin MacLeod) and a handful of its crew, with several passengers—played by various guest star actors for each episode—having romantic and humorous adventures. It was part of ABC's popular Saturday-night lineup of the time, which also included Fantasy Island until that series ended two years earlier in 1984. The original 1976 made-for-TV movie on which the show was based (also titled The Love Boat) was itself based on the nonfiction book Love Boats by Jeraldine Saunders, a real-life cruise director on a passenger cruise ship line. It was followed by two more TV-made-for movies (titled The Love Boat II and The New Love Boat), all before the series began its first season in September 1977. The executive producer for the series was Aaron Spelling, who produced several TV series for Four Star Television, and American Broadcasting Company (ABC) from the 1960s into the 1980s. In 1997, the episode with segment titles "Hidden Treasure", "Picture from the Past", and "Ace's Salary" (season 9, episode 3) was ranked No. 82 on TV Guide's 100 Greatest Episodes of All Time from TV Guide magazine. The Love Boat ran for nine seasons plus four specials. Another made-for-TV movie, titled The Love Boat: A Valentine Voyage, starring four of the original cast members, aired finally on February 12, 1990. MacLeod, Kopell and Lange are the only cast members to appear in every episode of the TV series as well as the last three made-for-TV movies. Grandy was in every episode throughout the run of the series, but was not in the last of the TV movies due to his 1986 campaign for (and election to) the United States House of Representatives. MacLeod was not the captain of the Pacific Princess in the first two TV movies and did not appear in them, although when his character was introduced there was a mention of his being "the new captain". Among the series' attractions was the casting of well-known actors in guest-starring roles, with many famous film stars of yesteryear making rare television appearances. 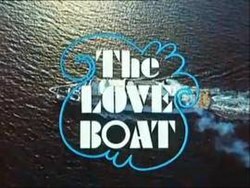 The Love Boat was not the first comedy series to use the guest-star cast anthology format—Love, American Style had used the formula seven years earlier—but it had such success with the formula that future series in similar style (such as Supertrain and Masquerade) always drew comparisons to The Love Boat. The series was followed on Saturday nights on ABC by Fantasy Island, which was likewise produced by Aaron Spelling, and had a similar format. The one-hour sitcom was usually set aboard Pacific Princess, at the time a real-life Princess Cruises cruise ship. Other ships used were the Pacific Princess twin sister vessel Island Princess, along with other cruise liners: SS Stella Solaris (for a Mediterranean Sea cruise), MS Pearl of Scandinavia (for a Chinese cruise), Royal Viking Sky (for European cruises, now MV Boudicca) and Royal Princess (now S.S. Artemis) and Sun Princess (for Caribbean Sea cruises). In 1981, P&O Cruises' line Sea Princess (now MS Veronica) was also used for the special two-hour episode "Julie's Wedding", set in and around Australia. Only the latter four ships still exist today. The series was filmed primarily on sets in southern California's—20th Century Fox Studios for seasons one through five, and the Old Warner Brothers Hollywood Studios for the remainder of the series. The "star of the show", the cruise ship itself, after being renamed the MS Pacific and being sold then owned by another cruise line in Spain, the now-world famous Pacific Princess was retired to Turkey in 2013, where she was scrapped by a ship breaking company after no further buyer could be found. Episodes set and filmed in other European and East Asian locations became more frequent instead of the usual west coasts along the Pacific shores of the Americas as the show continued. They traditionally aired as season premieres or during the sweeps months of February, May and November. Another unique aspect of The Love Boat was its writing format. Every episode contained several storylines, each written by a different set of writers working on one group of guest stars. As a result, episodes ended up with ungainly titles like "Disco Baby/Alas, Poor Dwyer/After the War/Ticket to Ride/Itsy Bitsy: Part 1". Even though the cast of the female detective sleuths of Charlie's Angels had been in separate episodes of the series, there was a crossover episode of the series in which the lady detectives had a case onboard the ship. On rare occasions, there were crossovers between the stories. In one episode, actors Robert Reed and Florence Henderson, formerly of The Brady Bunch, guest-starred in separate segments. In one scene, the two pass each other in a corridor, exchange a "Do I know you?" questioning, then do a double-take, and then continue on their separate ways down the hall without another word. In a one-time Fantasy Island crossover episode, the cruise ship makes a detour to deliver a troubled woman (played by Loni Anderson) to the mysterious island of Mr. Roarke instead of by the usual plane, and her storyline continued on that series. There were typically three storylines. One storyline usually focused on a member of the crew, a second storyline would often focus on a crew member interacting with a passenger, and the third storyline was more focused on a single passenger (or a group of passengers). The three storylines usually followed a similar thematic pattern: One storyline (typically the "crew" one) was straight-ahead comedy. The second would typically follow more of a romantic comedy format (with only occasional dramatic elements). The third storyline would usually be the most dramatic of the three, often offering few (if any) laughs and a far more serious tone. The series was also distinctive as being one of the few hour-long series ever made for American television that used a laugh track. Eight Is Enough, on the same network and produced at the same time, is another example. The Love Boat theme song was sung by Jack Jones (except for the last season, where a cover version by Dionne Warwick was used). The lyrics were written by Paul Williams with music by Charles Fox. The song has since been recorded and released commercially, by Charo in 1978 and Amanda Lear in 2001. The opening sequence for the series underwent three changes over the years. From seasons one to eight, the opening sequence began with a long shot of the ship before the camera slowly zoomed in onto its bridge area. This was followed by posing shots of the crew members (updated several times due to cast additions and changes throughout all seasons) at different points on the ship set. The long shot footage of the ship was used for the credits of the celebrity guest stars. For only the first season, the guest stars were credited by having their names appear on the screen while the series' logo, a radar/compass style circle with four hearts, wrapped around them. Beginning with season two (and originally experimented with in the fifteenth episode of the first season), the compass was graphically put in place and at its center, the guest stars were shown posing for the camera on different parts of the set (or a city spot used in on-location episodes) while their names appeared at the bottom of the screen. For the final season, the compass was replaced by a crescent wave and the long shots of the ship were replaced by a montage of the various locations traveled to on the series. At the center of the wave graphic, the guest stars were shown posing for the camera wearing their formal outfits against different colored backgrounds. For its first seven years, The Love Boat was very successful in the ratings. During that time, it ranked among the top 20, and even the top 10. For the 1980–81 season it posted its highest rating at No. 5. By the beginning of the 1984–85 season, the ratings were beginning to drop, and at the end of the following year, The Love Boat was canceled after nine years on ABC, although four three-hour specials aired during the 1986–87 season. The Love Boat entered the syndication market in the United States in September 1983, with Worldvision Enterprises handling distribution. As an alternative for stations with tight scheduling commitments, Worldvision offered edited 30-minute episodes in addition to the original hour-long programs beginning in the fall of 1986 after the series completed its original run on ABC. A two-part 1979 episode of Charlie's Angels—another Aaron Spelling series—called "Love Boat Angels: Part 1" and "Part 2" had that series' characters attempting to recover a stolen statue while aboard the Pacific Princess on a Caribbean cruise (all of the Love Boat regulars had cameo appearances). Isaac Washington also appeared in a 2005 episode of The King of Queens, "The Black List"
CBS DVD (distributed by Paramount) has released seasons 1–4 of The Love Boat on DVD in Region 1. Each season has been released in two-volume sets. On May 23, 2017, the original cast (MacLeod, Kopell, Grandy, Lange, Tewes and Whelan) reunited on Today, where it was announced they will be receiving a joint star on the Hollywood Walk of Fame for their contributions to television, sponsored by Princess Cruises. ^ "Then/Now: The cast of 'The Love Boat'". Fox News. Retrieved 1 August 2014. ^ Sean Daly (23 August 2016). "9 surprising facts about the 'Love Boat'". Fox News. Retrieved 12 April 2018. ^ Kelly Corrigan (13 November 2014). "'Love Boats' author returns from celebration cruise". LA Times. Retrieved 12 April 2018. ^ Gordon Cox (27 September 2013). "'Love Boat' Musical: Full Steam Ahead on Vegas Stage Version". Variety. Retrieved 12 April 2018. ^ "Picks and Pans Review: The Love Boat: a Valentine Voyage". People. 12 February 1990. Retrieved 12 April 2018. ^ Sloan, Gene (August 8, 2013). "Famed 'Love Boat' makes final voyage to scrapyard". USA Today. Retrieved 9 August 2013. ^ "Cruise ship tour: Last look at the original 'Love Boat'". ^ The Love Boat: A Valentine Voyage. 1990. ^ "See 'The Love Boat' cast reunite live on TODAY -- and get a big surprise!". today.com. NBC. May 23, 2017. Retrieved June 26, 2017. This page was last edited on 2 April 2019, at 19:00 (UTC).